I bought the 3GS iPhone last year. Love it! The phone itself is well worth the price, but AT&Ts monthly data plan is a bit outrageous. It's worth it though. 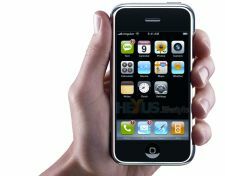 The closest phone competing with the iPhone is the Droid, which is perfect for those not wanting to support Apple or AT&T. The only bad thing about the iPhone is that it becomes a part of your life and you can't imagine living without it. There's life before the iPhone and then there's life after the iPhone. In other Apple news, the iPad came out yesterday and several of my coworkers bought them, which means I'll get to check it out when I go in to work Tuesday (Monday is a holiday for Easter). Sweet. Work is going well, although we've had some disruption in our little Oly group. The head honcho of the Oly office resigned due to political fights that he just could not overcome despite a superior product. It's a shame that it ended the way it did, but it looks like the rest of the office is safe and should be able to move forward unscathed from the battle wounds suffered by the web team. What's up with people (people=media+politicians) claiming global warming is not occurring? I usually don't get frustrated with other people's opinions, but when people can twist fact into opinion, I get really annoyed. This graph is a perfect starting point. The anti-global warming media has latched on to scientists stating that the earth has not risen in temperature in the past 10 years and that for 40 years starting around 1940, the earth actually cooled. It's not difficult to discern those facts from the graph, but those are isolated, very narrow views of a graph that is clearly showing an upward trend in temperature. Is 0.7 degrees celsius meaningful? How much of the warming is due to human activities and how much is natural? What can be done to slow down global warming and at what impact? The earth has been warmer in the past than it is today, so why should we be worried? These are more interesting questions worthy of debate. Along with global warming, another exciting topic is renewable energy. I read an interesting article about gasoline, specifically why our society is addicted to it, and the answer is, not surprisingly, relatively simple. It's powerful, cheap, abundant, and fully integrated into our infrastructure and society. An equal weight of gasoline delivers twice the energy of coal or methanol and over 100 times that of batteries. This is what is meant by "powerful". Furthermore, coal can be converted to oil for a cost of about $50 per barrel. As such, oil and gasoline will be around for many more decades. Some cool videos to check out: Byron, Mike and Phillip's new chart annotation site, Chartastic, Intel's rock star commercial, Auto Tune Meme (and yes, I bought the I am T-Pain iPhone app), and my favorite Intervention, Allison, split into 5 parts: Part 1, Part 2, Part 3, Part 4, Part 5. Perhaps I am reading the chart wrong ... but it looks like the temperature went down from 1940 to 1970's, and then went up from 1970's to present.